WOOP! Makes you feel happy already, right? 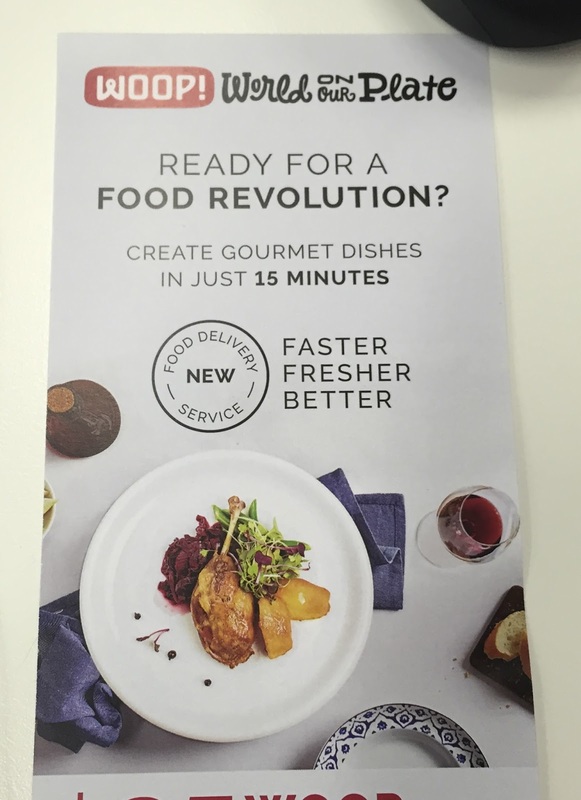 The first time I heard about the ready-to-cook meal delivery service (actually short for World On Our Plate), it was because I was on the TOMeTTE mailing list, and founder Thomas Dietz, whose new venture this was, offered us a $25 voucher to try it. I liked the idea of being able to create a tasty meal in 15 minutes, but then promptly forgot about it. I came across a thoughtful review of the initiative from Genie at Bunny Eats Design, again with a $25 discount offer, and again I filed it away in the back of my mind as something I needed to look into. It wasn't until someone at work had a flyer about it that I actually did something! Part of a WOOP flyer. And do I did! Not only did I sign myself up for a WOOP box with three meals inside, I bought shares in the company through Snowball Effect, even before I tried the service. It wasn't that I thought WOOP would be better than all current and future competitors; rather, it was the only such company that gave me a chance to have a slice of the pie, and I am guessing that having a quick and easy dinner on hand would be more and more important in our busy lives. So there you go, full disclosure, though I will still give you an honest opinion below. Getting started was pretty easy: just create an account, select your plan (I picked Table for Two for $109 per week, then used a $25 discount voucheer), and choose your delivery date (always a Sunday between 4-8pm). The only thing that I found unexpected was the 6-day lead time you need to start or stop your subscription. That's quite a bit of forward planning required! On the Saturday before delivery, I got an email telling me what the three meals for the week were, so even though I wasn't there when the courier turned up on Sunday, I knew what would be in the box. The ingredients came in discrete packets, colour-coded by meal. The same coloured spot was printed onto the matching menu to make everything crystal clear. In case you were feeling guilty from all the packaging you generated, the bottom of each recipe reminds you that the box and ice pack are recyclable (supposedly the vacuum pack film and trays are too, but I don't think the council would take them). There was even a little handwritten thank-you note inside! An index card told you what you needed for each meal, and I checked that everything was in the box. The main thing that confused me was that there were four tomatoes which weren't colour-coded. The fish meal called for "tomatoes", and the steak meal listed "small vine tomatoes" even though the name of the dish had "cherry tomatoes". I decided to use two tomatoes for each. Because of the expiry dates of the ingredients, you basically had to eat your meals in a particular order. Our first dinner had the most components, sounded the most exciting, and was actually better than we expected. And it took us less than 15 minutes to put together! Ingredients for monkfish curry meal. First, we opened the packet of raw monkfish and tipped out any liquid (though we briefly wondered if we were meant to do that, since there was no mention of it in the instructions). Then we poured in the tamarind marinade (labelled "fish marinade"), and mixed it around. It was good to see the marinade ingredients listed on the bottom of the container. Meanwhile, we prepared the vegetables, and exclaimed over what a great idea it was to leave coriander attached to the root. We also zapped the poppadoms in the microwave to make them crisp and bubbly, though they emitted a strange smell and weren't as crisp as the ones you get at a restaurant. Poppadoms before and after 20 seconds in the microwave. Then we basically heated up the curry sauce and poached the fish in it, and chucked the rice in the microwave. That was it! We threw everything onto a plate, and devoured it. We didn't care for the poppadoms, but the curry itself was fragrant and beautifully flavoured, tangy with plenty of ginger. We would happily eat this again! Monkfish curry - not that pretty, but tasted great! Our second meal was even easier to prepare, but took longer because you needed to preheat your oven before baking the chicken and potatoes. Fewer ingredients for baked chicken. I was pleasantly surprised to find whole cherry tomatoes in the sauce, though it tasted a bit thin compared to the complexity of flavours we experienced the previous night. After 20 minutes in the oven, the chicken and potatoes heated through, but didn't really crisp up. Perhaps it could have done with a higher temperature. The portions were large (we didn't manage to eat the three chicken thighs), but sadly, we didn't enjoy our dinner as much as before. For our last WOOP meal, we baked the kumara for longer and at a higher temperature than specified, and also cooked the steak the way we normally do. The end result was actually pretty similar to what we might have put together ourselves, except that we would have cooked the kumara from scratch, and not have had the salsa verde (we didn't have much of it anyway because its strongly garlicky flavour overpowered the rest of the meal). Simple steak with kumara and salad. In fact, we would probably have cooked a better meal ourselves, because we could have done a better job of the kumara, bought better meat, and picked a more interesting vegetable like Brussels sprouts, courgettes or asparagus. Mesclun is the kind of thing we buy when we can't be bothered, and if we were to sign up for a food delivery service, it would be to get away from that. Still pink in the middle. I think there's a demand for home-cooked meals that are quick to prepare, yet fresh and delicious. If all the meals had been like our first one, we would be chuffed. Unfortunately, you can't know what you will have in your box until after you have ordered it, and we had food envy looking at what Genie got in hers (she only had one set of boring leaves, and at least it came with edible flowers!). There is no point in keeping the recipe cards, because you would need the prepped ingredients to make use of them. Having said that, I am often home so late that I would pick this over cooking from scratch, and it is more fun and fresh than a freezer meal, and more healthy than a takeaway. At around $18 per meal per person, it feels a bit too expensive for what it is, especially when I consider how basic meal #3 was. However, it does include delivery so it saves on travel as well as cooking time, and as this service is still new, I am confident the team will be able to take on feedback and improve their offerings. Looking forward to trying this again, when they have had more time to work on their menus! This post is part of Our Growing Edge, a monthly blogging event aimed at inspiring us to try new things. This month, it is hosted by Hannah from Love The Little Bakery. Great balanced review, NNP. I've been tempted by these food deliveries, but haven't signed up for three main reasons, - 1. I get a hankering for Malaysian or Chinese food half the week, and 2. I like having leftovers for lunch, and 3. It's expensive as I still have to go to the supermarket for other groceries and staples. One big plus though, - it takes the stress out of cooking when you're hungry. 3) Although you still have to go to the supermarket for other things, you don't need to have planned your meals in advance, or risk buying food which doesn't end up getting eaten. I agree that it doesn't make sense to sign up for something like this if it's not what you generally want to eat. Even though the meals are supposed to be international, they do seem to be mostly European and very meat focussed, with minimal attention paid to the vegies. I've only tried WOOP for a week though, so hoping I just got the wrong impression!